rv-pro.com November 2018 • RV PRO • 61 turer in Elkhart County, where the labor market is already extremely tight? 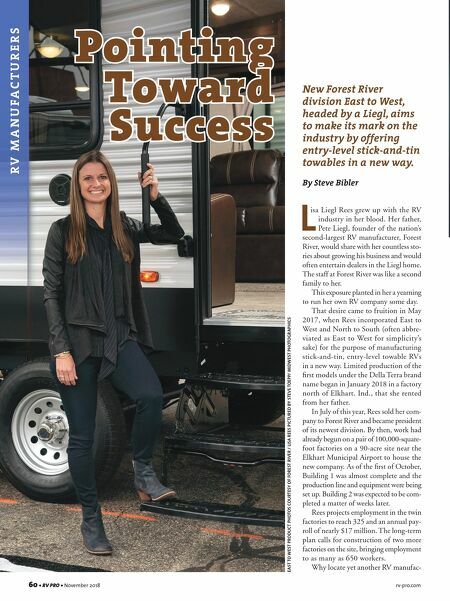 "It's where the RV industry is," she says matter-of-factly. As for the company name, which Rees abbreviates to East to West in her correspondence, she says a lot of thought went into it. The name "summarizes our sales strategy: We're starting in the East and hope to conquer the West, and obviously North and South, too," she says. "If you're building in Elkhart, Ind., as a startup, you start on the East Coast and get bigger and develop across the West Coast. That's where our name origi- nated. It's the thought of the compass and being able to travel the United States." Simplicity by Design If there is an underlying theme to East to West's products, it is simplicity by design. Instead of many floorplans and options, East to West is building just eight floorplans with one exterior color (gray-white with blue accents), one interior décor (an earth-tone brown) and very few options. This approach should simplify the production process, and in so doing, increase the quality of the product and customer satis- faction, while reducing the cost of production, according to Rees. Most features of the Della Terra (Italian for "of the earth") are standard, thereby simplifying the manufacturing process, she says. She considers the key features to be a true king-size bed with 9-inch inner spring mattress, an 8-cubic-foot refrig- erator, a 15,000-BTU air conditioner and lots of overhead and pass-through storage. "A lot of those features are options for other companies, but we've made them standard," says Rees, who has no formal expe- rience in the RV industry but sports an unmatchable pedigree. To let in light and offer a nice aesthetic, Rees says Della Terra trailers feature large windows on the sides of the slide-out, a side window that is 40 percent larger than the industry standard At left: East to West President Lisa Liegl Rees is pictured standing next to one of her company's new travel trailers at the Forest River Expo. Limited production of the first Della Terra models began in January 2018. 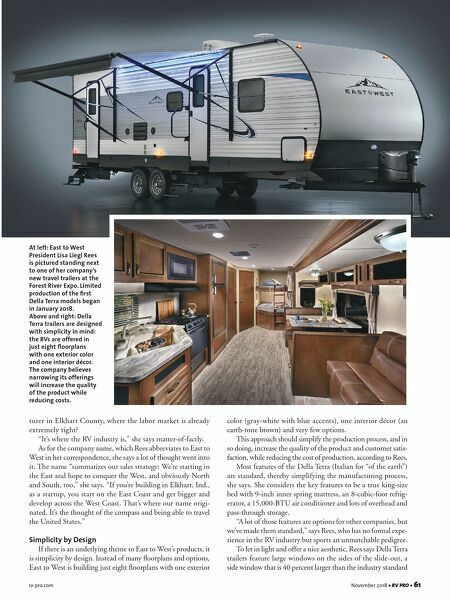 Above and right: Della Terra trailers are designed with simplicity in mind: the RVs are offered in just eight floorplans with one exterior color and one interior décor. The company believes narrowing its offerings will increase the quality of the product while reducing costs.